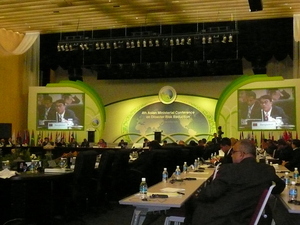 ADRC participated in the 4AMCDRR held in Incheon, Republic of Korea from 25 - 28 October 2010. More than 900 participants comprising ministers of disaster management from 53 Asia-Pacific and European nations, representatives from UN agencies, international organizations, and NGOs attended the conference. The Prime Ministers of Republic of Korea and Kingdom of Bhutan were among the high level participants. Under the theme "Disaster Risk Reduction through Climate Change Adaptation" (DRR through CCA), the conference was organized into three sessions: Session 1 "Raising awareness and building capacity for DRR & CCA", Session 2 "Developing and sharing information, technology, sound practices, and lessons learned in climate & disaster risk management", and Session 3 "Promoting integration of DRR & CCA into development for green growth". ADRC chaired Technical Session 1 and co-chaired the High Level Round Table of Session 1 (HLRT1) with the Maldives and Bhutan. The outcomes of the technical session emphasized two key concerns. One is the need for training for both government officials and civil society organizations. The other is the need to learn from local and indigenous peoples on how they manage risk and the need to support their efforts in raising awareness. In this regard, it was suggested that DRR and CCA should be framed within local and national development planning. At the HLRT1, the ministers expressed problems of their countries, including issues on raising awareness and building capacity. HLRT1 recognized that problems vary from country to country, and that solutions need to be localized. HLRT1 had drawn commitments from delegates to work together and share technical knowledge. Recommendations from Technical Session and HLRT1 were reflected into the conference outcome documents: Incheon Declaration, Incheon Regional Roadmap or REMAP, and Incheon Action Plan aimed at establishing climate resilient disaster risk management systems by 2015 that will contribute to sustainable development at the regional, national and community levels. ADRC also co-organized various side events at 4AMCDRR including "Incorporating space-based information and technologies into DRR and CCA" with UNOOSA, "Asian Film Festival on Disaster Management" with GFDR and ADPC, and "A tool for Better Recovery: Introduction to Guidance Notes on Climate Change Adaptation and Recovery" with IRP. The next AMCDRR will be held in Indonesia in 2012 and the progress of REMAP will be reviewed accordingly. For more information on ADRC's activities during the 4th AMCDRR, please see the ADRC Highlights to be issued shortly.